In addition to external bomb capacity, the Mk.2 was proposed to carry passengers. Two wing troop carriers were proposed for the wing hardpoints, able to carry 26 passengers in each carrier (with a toilet). In addition 40 passengers were able to be carried in a sealed, windowless capsule carried in the bomb bay, giving a potential passenger load of 92. Not surprisingly no passenger modules were completed. Passengers get too rowdy, push the button, problem solved. No Victors were exported, although both Australia and South Africa expressed interest in purchasing Victors. In 1959 Australia considered both the Victor and Vulcan, but preferred the Vulcan. No purchase was forthcoming for Avro however, and Australia instead became the only export customer for the American F111. In 1961 consideration was given to South Africa purchasing 8 B.2 Victors. SAAF serial numbers 8001-8008 were allocated, but due to political considerations the deal was blocked. Instead Blackburn Buccaneer aircraft were purchased, although a second purchase contract was in turn blocked. 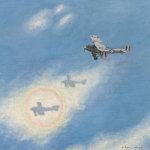 South Africa would have chosen B(SR) Victors, being capable of alternating between bomber and recon roles. 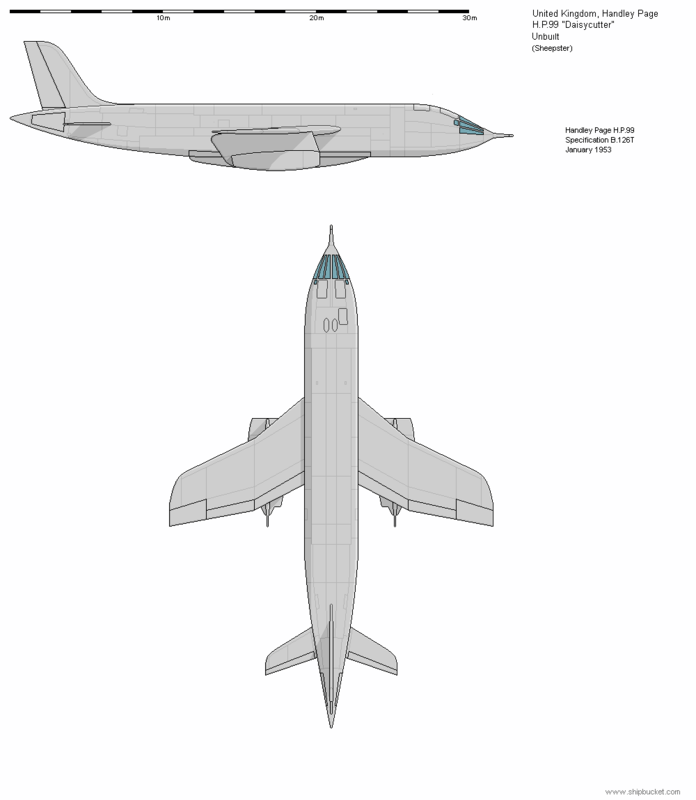 The aircraft would have been initially deployed against Angolan communist and Cuban targets in the Angolan Bush War, and with the retirement of the Avro Shackletons they would have been transferred to maritime patrol duties in the 1980's. Well, I certainly wouldn't like to fly as a passenger on that Victor. Great work with SAAF paint schemes. With the planned V-bombers being "super Lancasters", to attack at in excess of 40,000ft, the RAF also requested a bomber able to fly to target and attack from 500ft or less to complement the V-bombers - a "daisy cutter". To cope with the stresses of low-level operations the prospective bomber would require small, highly loaded wings - but the project was predicated on the design of a stand-off nuclear weapon as payload. HP's submission was a development of the Victor. The small wings necessitated the paired engines being mounted on underwing pods. Before air-to-air refueling had been trialed on the Victor, the initial location of the refueling probe was centrally on the nose. While Bristol planned to carry the munition piggy-back style, HP planned to carry the weapon extending from the belly bomb bay, in the same manner that would be later used with the Blue Steel on the Victor. By September 1954 the Specification was withdrawn, primarily due to the complexities of designing the weapon to validate the aircraft's designed mission. 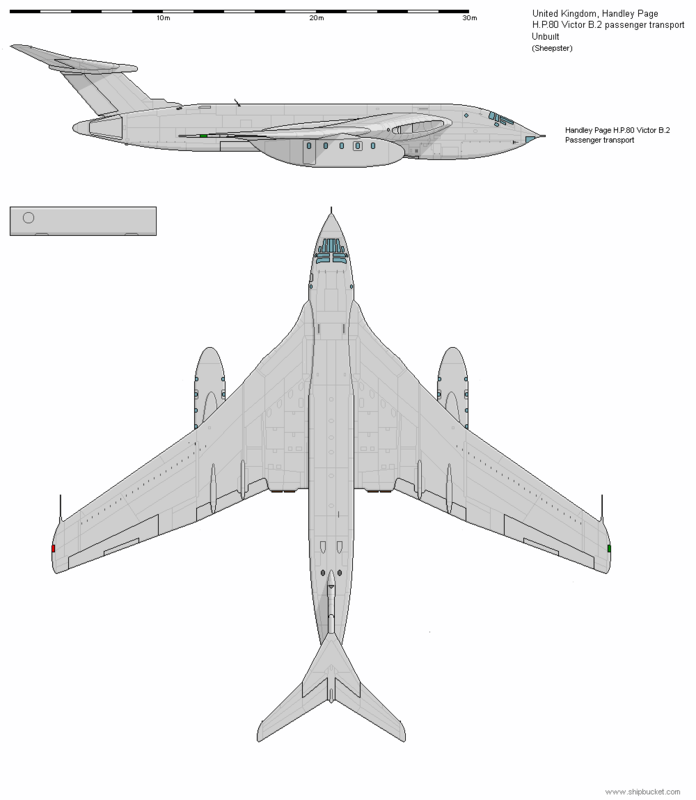 Once the wing design for the Victor was settled, HP also started design work on transport versions of the Victor. 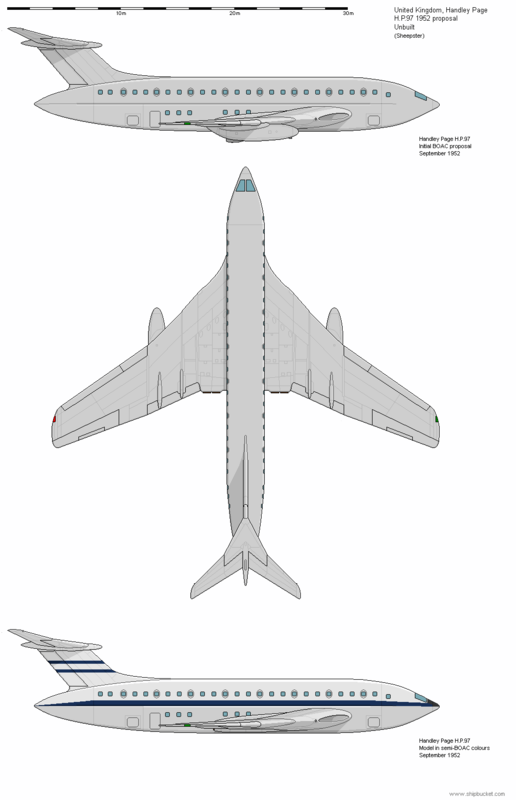 In 1952 they presented two different designs using the Victor wing, engines and tail, but with completely different fuselages. 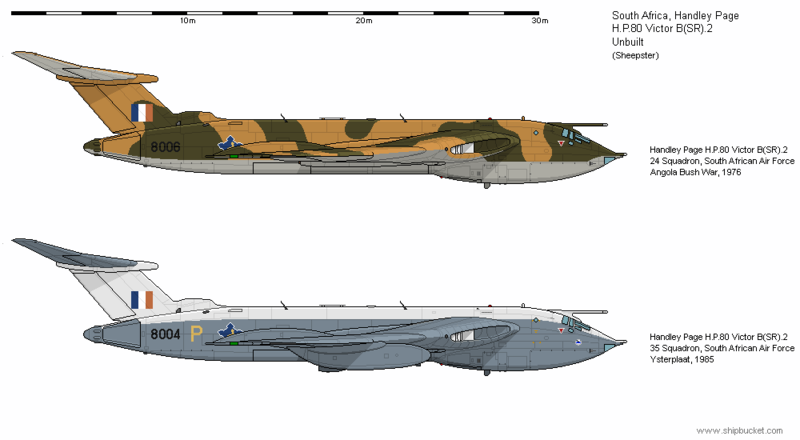 The first design was tendered to the RAF as a military cargo and personnel transport. The H.P.96 was a minimum change design, utilised a new circular fuselage, widened almost to the size of the Victor radome bulge. 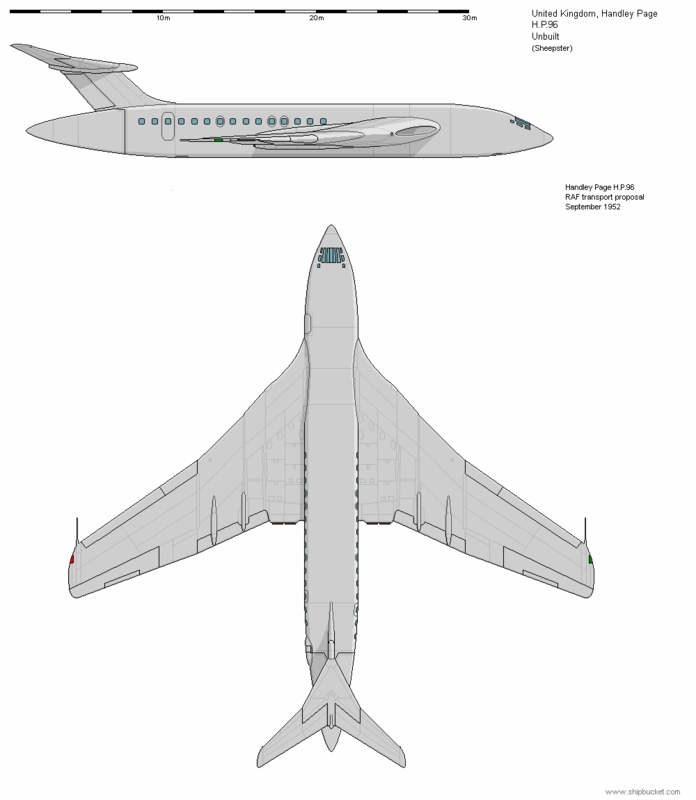 The only significant innovation was the inclusion of a swing tail, similar in design to that used on the Canadair CL-44D, and later by Boeing on their 707 derived 735. The cabin volume was seriously compromised by the wing attachment and follow through, and could only carry a maximum of 85 passengers, although long loads of 40ft length could be carried through the tail. As the advanced aerodynamics of the Victor had not yet flown and been proven, the RAF were reluctant to progress the project, and it was not considered further. 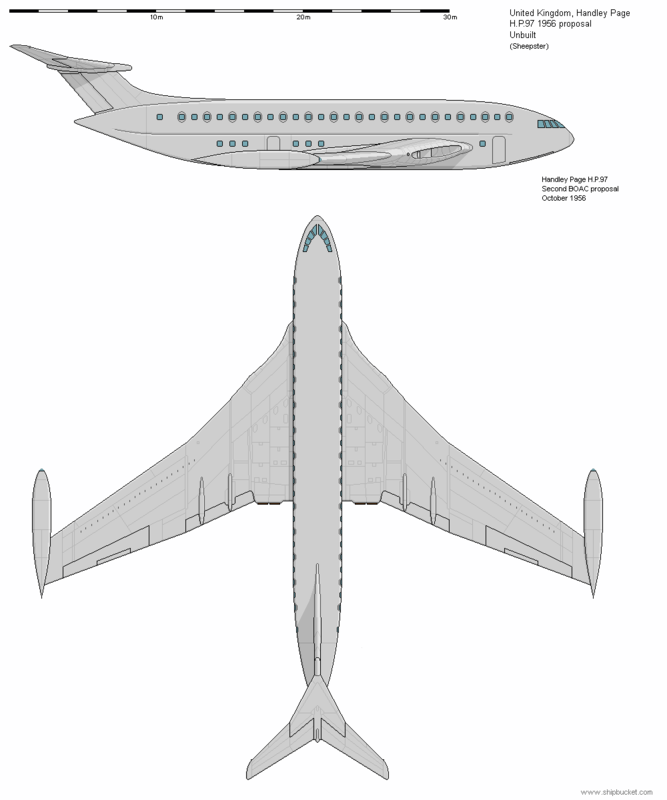 The second proposal was for a "double-bubble" civilian airliner, using the fuselage shape successfully used by Boeing in the 377 Stratocruiser, to allow an uninterrupted passenger cabin, able to seat up to 150. Strangely for a civil aircraft, the military-style external fuel tanks were to be fitted for long-range trans-Atlantic sectors. Like its military sibling, the H.P.97 gained no traction and BOAC displayed only minimal interest - but marketing models of the aircraft in semi-BOAC colours were produced, sometimes confusingly mislabeled as "H.P.96". Thanks very much to Hood for providing more data on the H.P.96 - giving a much more satisfying illustration. Last edited by Sheepster on February 5th, 2019, 3:37 am, edited 2 times in total. Having written an article on the HP.96, this is a subject close to my heart. I was wondering what source you used for your drawing? The internal plan drawing I have seen has a door on the portside roughly where your swinging tail joint is. The tail area was much more smoothly shaped rear fuselage as you have portrayed for the HP.97. I can send you my source via PM to refine the drawing. Thanks Hood please PM me. I would love to have read your article as the info on the 96 is so pauce that this illustration is most unsatisfying. In October 1956 HP published a new civil Victor design, re-using the H.P.97 designation and so further muddying the waters. The new H.P.97 retained the double bubble fuselage concept, but that was all that was in common with the original H.P.97. 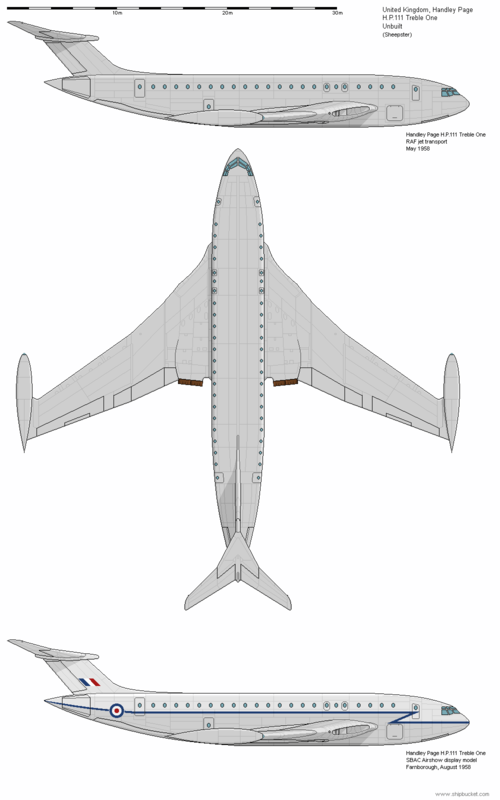 The new design incorporated the Victor B.2 wings and engines with a new more modern airliner cockpit section and fitted wingtip fuel tanks. While Sir Frederick HP lobbied BOAC hard for the aircraft his efforts again amounted to naught. A version of the H.P.97 was offered to the Royal Australian Air Force initially as the H.P.97A, and then becoming the H.P.101, but again the aircraft was unsuccessful in attracting an order. In 1958 HP produced their final Victor derivative, the H.P.111 Treble One. 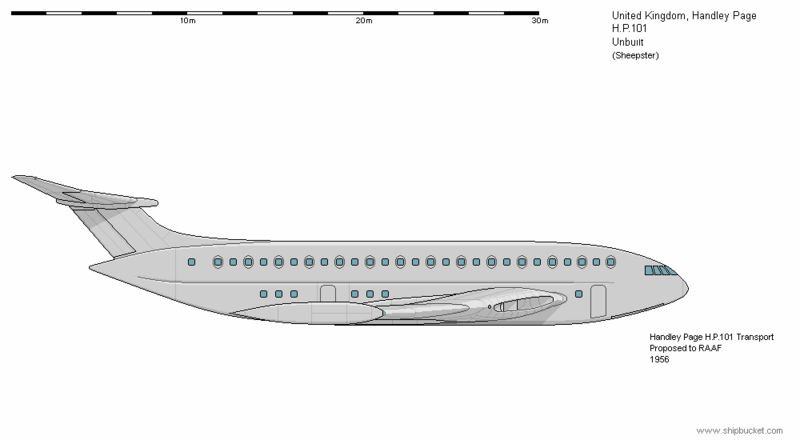 Using now an enlarged circular fuselage to create a double deck "widebody", the H.P.111 also fitted with thrust reversers and silencers and a new 6 -wheel bogie undercarriage. HP was experimenting with wing boundary layer control in other designs, and featured blown flaps with compressed air from the engines being ducted onto the flaps to energise their airflow. This gave the H.P.111 the ability to operate as a tactical transport onto 900m forward grass airstrips. The aircraft could carry 202 passengers or 120 paratroops, dropable through the rear clamshell cargo doors. A novel feature of the cabin was that the mid-decking could be internally lowered or raised to create a single large volume cargo bay. The RAF selected the H.P.111 as their choice for a strategic heavy transport, but the British policy of aviation industry suicide intervened. The Government instead chose to build the Belfast at the State-owned Shorts factory.